So China devalued its currency peg almost 2% against the dollar. It happened just as I was wrapping up a twitter debate on this very possibility, a very surreal experience. Many more twitter discussions erupted after the announcement of this policy change and I got sucked into a few of them. My key takeaways from these discussions on the yuan devaluation are as follows. First, this devaluation was almost inevitable. The figure below superficially shows why: the economic outlook in China had been worsening. The question is why? As I explained in my last post, the proximate cause is the Fed's tightening of monetary conditions. China's currency is quasi-pegged to the dollar and that means U.S. monetary policy gets imported into China. The gradual tightening of U.S. monetary conditions since the end of QE3 has therefore meant a gradual tightening of Chinese monetary conditions. Recently, it has intensified with the Fed signalling its plans to tighten monetary policy with a rate hike. U.S. markets have priced in this anticipated rate hike and caused U.S. monetary conditions to further tighten. 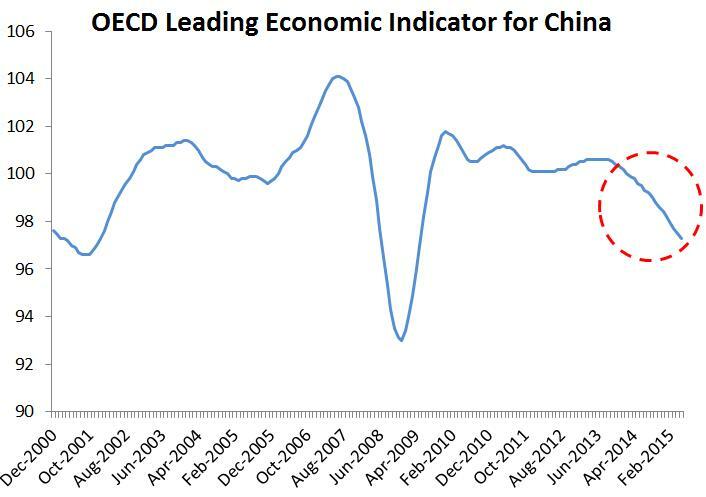 Through the dollar peg this tightening has also been felt in China and can explain the slowdown in economic activity. Consequently, China had to loosen the dollar choke hold on its economy via a devaluation of its currency. There is, however, a more fundamental reason for the devaluation. 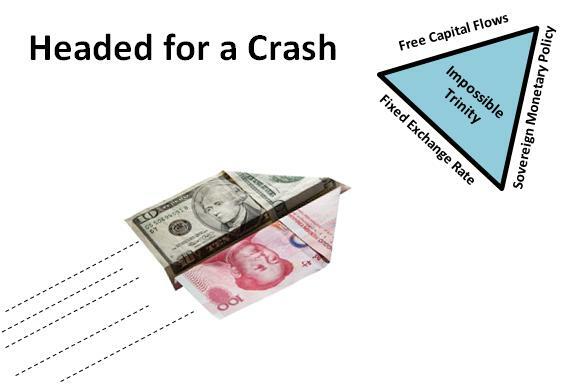 China has been violating the impossible trinity. This notion says a country can only do on a sustained basis two of three potentially desired objectives: maintain a fixed exchange rate, exercise discretionary monetary policy, and allow free capital flows. If a country tries all three objectives then economic imbalances will build and eventually give way to some kind of painful adjustment. China was attempting all three objectives to varying degrees. It quasi-pegged its currency to the dollar, it manipulated domestic monetary conditions through adjustment of interest rates and banks' require reserve ratio, and it allowed some capital flows. This arrangement could not last forever, especially given the Federal Reserve's passive tightening of monetary policy. One manifestation of the tightening monetary conditions in the United States has been the appreciation of the dollar. Given the peg, the yuan has been appreciating too and appears to have become overvalued. China maintaining its peg against an apppreciating dollar would only have worsened this yuan overvaluation and intensified the drag it created for the Chinese economy. Already, the resulting slowdown and anticipation of Chinese authorities devaluing the yuan has lead to a $800 billion capital outflow from China. Since China desires its currency to become fully convertible in the future and because party leaders in China are unlikely to give up control of domestic monetary policy, it is almost a given that the adjustment to Chinese policy would have to come through a change to the yuan exchange rate. So this is the deeper reason for the devaluation. And it is the reason that the devaluation is probably just the first step toward an eventual floating of the yuan. Second, those folks who are worried about the deflationary shock from this devaluation seem to forget the existing peg was creating its own deflationary shock. The idea behind the former concern is that via the devaluation Chinese goods will become cheaper to the rest of the world and given their abundance will drive down prices globally. My reply is that the tightening of U.S. monetary policy was already slowing down the Chinese economy and, as a result, creating deflationary pressures across the world. Just look at commodity prices. Moreover, the yuan devaluation need not necessarily cause a deflationary shock if the other central banks ease in turn. For example, it is likely the Fed will put off its interest rate hike this year and maybe do more easing if the yuan devaluation truly causes a large deflationary shock. Third, this experience highlights the importance once again of carefully choosing the currency block you join. Just like the ECB's application of a one-size-fits-all monetary policy to the very different economies of the Eurozone has proved harmful, so has the the one-size-fits-all monetary policy of the Fed to the dollar block countries proved harmful. In this case, it has proved harmful to China. Of course, the Eurozone is a currency union with a central bank that should be mindful of the entire Euro economy whereas the dollar block is number of countries that chose to peg to the dollar on their own and therefore are not the responsibility of the Fed. Still, the same principles apply: if you do not share the same business cycle or have adequate economic shock absorbers you probably should not join the currency block/union. Update: To clarify on the impossible trinity note that prior to devaluation China had cut its benchmark interest rate four times since 2014 and cut its required reserve rate 50 basis points while maintaining the dollar peg. The domestic monetary easing has put downward pressure on the yuan and requires Chinese authorities to burn through its dollar reserves to defend the peg. As noted above this has cost the Chinese $800 billion over the past year. Investors realize that at some point this will be too seen too costly as the dollar continues to appreciate. China will have to devalue. This anticipation only hastens the capital outflow. China, in short, has been trying to do too much: defend the peg, tinker with domestic monetary policy, and allow capital flows. 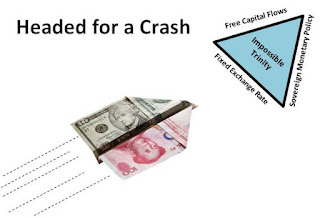 China is running up against the impossible trinity. David, makes you want to cry with the quality of MP from the Fed! Fed tightening blightening. China is doing that for a dying growth model just like Korea in 1990 or Japan in 1972. Yawn. But isn't the world far more globalized, China far bigger, and therefore the Fed's tightening a bit more consequential now? Not really. China can't grow at the speed they did for the 30 year run because it has run out of room investment wise via productivity. So they either develop themselves for more consumption or just drift awhile. They may prefer drifting awhile. The Feds passive tightening is not surprise since core inflation is rising. That is a sign of monetary inflation while overhead inflation drops due a overrated commodity correction. The analysis is so bad right now, people are ignoring the huge capital flows in Commercial Real Estate and sequentially, Residential Real Estate. Very bad analysis. Backward looking. I suspect there is going to be some econ-bears capitulating next year causing the next bubble as they reenter the market..........begrudgedly. The Fed needs to think stimulus. How about normalizing rates on excess reserves? Of a steady $50 billion a month in QE as a matter of conventional policy? Tax monetization is another great idea. Or, we could go to a deflationary recessionary vortex for a few decades and skyrocketing federal IOUs...see Japan. It is better to fail conventionally than to take any chances? Isn't QE just displacing capital flows in the US and causing capital flows to China, which are merely used to support the Peg? Do we really want to permanently entrench QE? It seems that QE is the US version of "Souveirgn Monetary Policy" and part of the imbalance suggested. While I feel for the 'tightening blightening' we have no political union with China. Hi, David. How about the possibility that China moves to a slightly more flexible arrangement like basket, band, crawl (BBC) a la Singapore? The explicit band / central parity would be a key difference, but at least they can have a clearly communicated rule for occasional deviation from US dollar that way, no? Btw, love your work / writings (alongside Scott's). Thank you for these enlightening posts and keep up the good work! Would you really say joining the "dollarzone" has been harmful to, say, the dollarized economies of Latin America relative to the monetary policy regime they otherwise would have had? Fair point, but even here I would say it depends. Some dollarized economies like El Salvador or Ecuador are probably better off (even if their currency gets overvalued at times) than the alternative of hyperinflation they experienced prior to dollarizing. Other places, though, like Argentina though better off initially from the currency board peg in the 1990s eventually became choked by it given the rising dollar and their inability to maintain fiscal discipline. So it depends. Thank you, that's a thoughtful response. It may be getting far afield of the point, but since you referred to Argentina as having had a "currency board" are you aware of Kurt Schuler's argument that Argentina's system was not a true currency board? If so, do you disagree, and why? Yes, I familiar with Kurt's argument. His point, as best I can recall, is that the government was cheating and not truly maintaining a hard peg. It seems that this was especially true near the end. A couple of thoughts. First, even though this cheating happened, overall my recollection is that the real exchange rate still rose significantly. Argentina was pegged to the soaring dollar, but its major trading partners were Brazil and Europe. The big-time appreciation was also reinforced by fiscal imprudence. So whether its was a hard peg or not, the Argentine peso appreciated dramatically and made it tough for Argentina to function at the end. Second, to the extent it was a dirty peg and not a true currency board is a testament to why the Argentina peg was bound to fail from the beginning and therefore probably idea to try. Argentina simply did not have the institutions in place to credibly commit to the hard peg. To summarize, a currency board may be an appropriate arrangement in some context even if it occasionally leads to an overvalued currency if the alternative is worse. This assumes the country has the institutions and ability to credibly commit to it.In many cases, like Argentina, they don't exist. "The idea behind the former concern is that via the devaluation Chinese goods will become cheaper to the rest of the world and given their abundance will drive down prices globally. My reply is that the tightening of U.S. monetary policy was already slowing down the Chinese economy and, as a result, creating deflationary pressures across the world." The way this is written makes it sound like whether monetary conditions are loosened or tightened, the result is deflationary. (If we take currency devaluation as a de facto loosening of MP). Seems weird.